Annyck and Lisa have kindly shared their experiences with Maternity nurses and Au pairs. Here’s a quick summary of the other options. A nanny either lives with you full time or they may live out of your house. They take sole charge of your children only (unless you have organised a nanny share, where other children may also be looked after at the same time). It is possible to find a nanny to just work with your family for a small amount of hours per week. (We started with 20 hours, and dropped to 10 hours more recently). The nanny will most likely fill up their week with other families like you looking for smaller numbers of hours per week. In my experience there are more nanny’s prepared to do this than I first expected, so don’t worry that you won’t find someone if you are only offering a few hours. 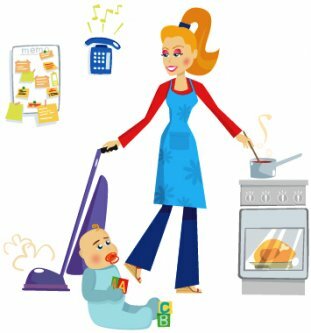 Their responsibilities normally start and end with all things child related, so unlike an Au pair or Mother’s help, they will not do housework. A nanny is your employee and so must be treated as such. Therefore you must pay employers NI & tax, and the nanny’s NI & tax. In addition, if you pay for your nanny’s first aid course (approx £110 every 3 years), Nanny insurance (£65 per year) and OFSTED registration (£100ish) a year) – this enables you to meet the requirements to be able to claim childcare vouchers from your employer if they operate such a scheme. You may have to pay maternity pay for your nanny if she becomes pregnant. The best nanny is usually found via word of mouth, and often do not have a lot of downtime between jobs. Mother’s Helps are generally unqualified nannies working alongside a mother, rather than having sole charge of the children. Mother’s Helps may work well for parents who work from home or parents who work part-time and want housework and childcare combined. Unlike nannies, they are expected to help out with light housework and shopping. Not solely there for children. This means that you could send your mothers help to the supermarket or to do the errands, while you do the fun stuff with your children. As the Mother’s Help gains more and more experience, they may be able take more responsibility and ultimately sole charge. Some start out as a Mother’s Help and gain enough experience to be considered for nannying posts in their next job. A Mother’s Help must be at least 18. They may have no formal qualifications but should have good experience with children. They may have cared for siblings, done regular babysitting or helped out at a local playgroup. Children have opportunity to socialise with children other than their siblings. Your child will have a key worker that observes your child and looks for learning opportunities as they present themselves. It can take time to find the right setting for your child. This can take time so you need to start looking early. You may need to take time settling the child in. Fees are payable for both children, there may be a small discount for the second child. It can work out as quite an expensive option with twins. if your child has a temperature or is ill the day care may not allow them in for the session. You will still be required to pay for the session. normally, no more than one child may be under the age of 1, however a child-minder may be registered to care for two children under the age of 1 where they are able to demonstrate that they can meet and reconcile the individual needs of all the children being cared for. Can be a cheaper option than some others outlined above. A child minder must be registered and is subject to ofstead inspections similar to schools and day cares. As with day care you will not be able to leave your child if they are ill, but will still have to pay for this session. It may be hard to find a child minder that can take your twins as they have to have special dispensation to care for more than 1 child under the age of one. One of our club members is a full time child minder so if you have any further questions please send as an email and we will forward them on to her. Home-Start (free, but not a full time option for care of your children). Anyone with 1 child under the age of 5 can ask for help from the sure start centre, regardless of income. A Home-Start volunteer will visit you regularly (usually once a week for a couple of hours) and offer friendly support through difficult times for as long as you need help. They can give you reassurance that you are not alone as well as a listening ear and a shoulder to cry on. You might need an extra pair of hands to help you cope with everyday situations or even practical help with activities like playing or story time. If you would like to contribute to this story with your experiences please do so via our email address or on facebook.